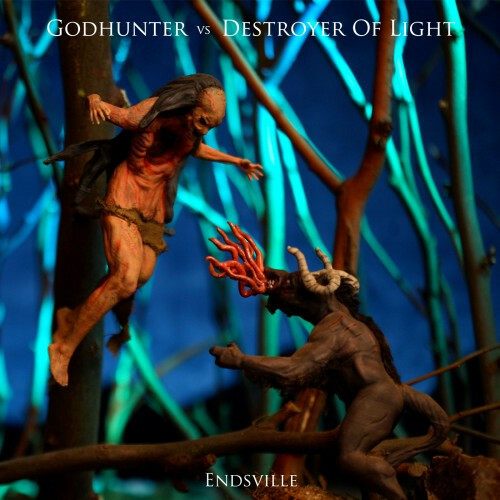 Endsville is the apt name for a forthcoming split by the Tuscon/Vancouver collective who call themselves Godhunter and Austin-based Destroyer of Light, with each band contributing a long EP’s worth of material. It will be released on July 24. We now have for you the premiere of two songs from the split, one by each band. Your average highly paid therapist would devote years attempting to figure out what’s “wrong” with people who like this kind of music. It’s not food for the soul, it’s poison. It’s not shelter from the storm, it’s a hard shove into the deluge. Forget “life-affirming” — this is a rendition of all that’s wrong with life, except for the life-saving power of a titanic riff, and therein lies part of the answer. I don’t know what the rest of the answer is. I do know this — a lot of life for a lot of people is no damned good, and to find music that both powerfully captures its ugliness and despair and yet somehow takes you away from all that at the same time, that’s a gift, and both these bands have it. You can move to these songs (you probably won’t have any choice), and you can lose yourself in them, too. From the first half minute of “Dull Knives, Weak Handshakes”, Godhunter generates an atmosphere of disease and impending catastrophe. The riffs are massively heavy, vibrating like Geiger counters in the presence of plutonium, and just as destructive as radioactive decay. The drum strikes fall like bombs, and the guitar solos amplify the music’s aura of debilitating illness. They writhe and twist, and sometimes they skitter like roaches suddenly illuminated in a floodlight. 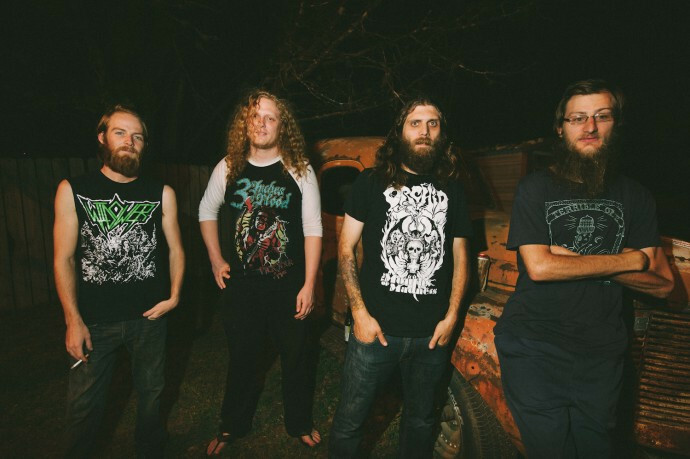 The vocal variety in the song is also one of its strong points, ranging from hoarse roars to lacerating growls to wailing clean vocals that rise up like a graveyard mist. And if you’re a fan of bass guitar (as I am), you’ll like the way the song ends, too. A vicious, crushing piece of work. The rolling drumbeats that begin “Valley of the Dead” sound like an avalanche in slow motion, and the riffs that join them have a similar earth-shaking heaviness. They groan and pound like giant excavating machines digging a quarry straight down to hell, with the stench of sulphur billowing around their heaving operations. It’s oppressive, doomed, titanic music. The first guitar solo is slow and squalling. The second one feels like someone just dropped acid in your beer before you chugged it straight down. Past the mid-point, the vocalist’s anguished proclamations become a harrowing shriek just before the music becomes so crushing and cataclysmic that it almost makes what came before feel like a mercy. But of course, there’s nothing merciful about this song. It’s plague music, the soundtrack to a slow, agonizing death. Endsville will be jointly released by Battleground Records and Heavy Friends Records on July 28. It will come in the form of a double 12” vinyl packaged in gatefold format, with custom sculpture art by Bestia Dentro and photography by Andrew Weiss. The Godhunter disc will come in translucent green vinyl, and Destroyer of Light’s takes shape in translucent red. The album will also be released as a digital download on the same day. Preorders for the vinyl are available HERE and the digital is HERE. If the songs we’re premiering don’t succeed in flattening you, there are some other tracks from the split out there. 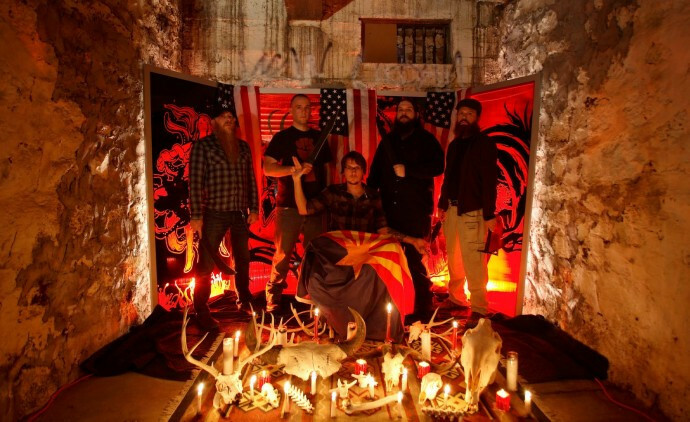 The Obelisk premiered a lyric video for Destroyer of Light’s “Electric Shadows” created by Erik Bredthauer (here), and the Frank Huang-created NSFW video for Godhunter’s “Cassandra Complex” was launched by CVLT Nation (here). The day after the release of the record the bands will jointly begin the Endsville 2015 Tour, which will cover a large swath of the US. It will include performances by both bands at the Death To False Metal Festival in Hamden, Connecticut, on August 14th and 15th with Whiplash, Krieg, Secrets Of The Sky, Valkyrie, Imperial Triumphant, Nightbitch, Immortal Bird, Secret Cutter, and more. All the dates are listed below. You have doomed the doom I doomiously doomed with a doomier helping of doom. Doom.